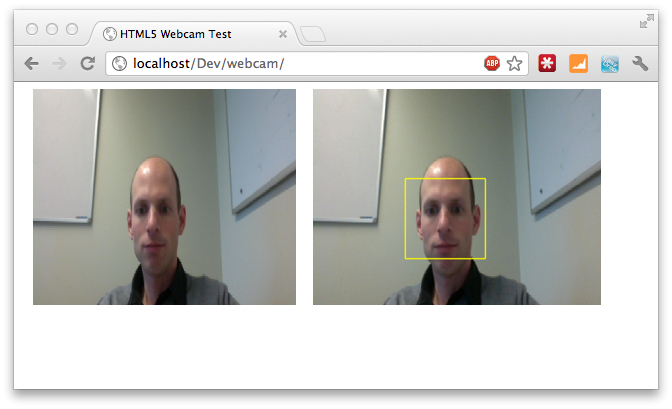 In a recent article I showed how you can use webrtc, canvas and websockets together to create a face detection application whose frontend runs completely in the browser, without the need for plugins. In that article I used a Jetty based backend to handle the image analysis using OpenCV through the JavaCV wrapper. When I almost finished the article, I noticed that websockets is also supported from Play 2.0. I really like developping in Play and in Scala so as an experiment I rewrote the backend part from a Jetty/Java/JavaCV stack to a Play2.0/Scala/JavaCV stack. If you want to do this for yourself, make sure you start with the frontend code from here. Since the frontend code hasn’t changed except the location where the websockets are listening. With these files added to my repository I can setup the dependencies for the Play 2.0 project in the Build.scala file. "javacv" % "javacv-macosx-x86_64" % "2.3.1"
Now run “play update” and “play eclipsify” to update the dependencies and your Eclipse configuation (if you’re using Eclipse that is). Using websockets in Play 2.0 is very easy. The first thing you need to do is add the URL to your routes configuration in the conf directory. In this code we configure an input channel (in), and an output channel (out) and connect them to the socket. Whenever the HTML5 client sends a request over the websocket our “in” method is called, and when we want to send something to the client we can use the “out” channel. The “in” channel needs to be defined as an Iteratee (more info see these Play docs). What this does is, that for each input message we receive we run the specifici method. In this case we run the FaceDetect.detect operation (more on this later) and the result from this operation is pushed back to the client using the “out” channel. This “out” channel itself is defined as an Enumerator (see these play docs). We can attach different listeners if we want to this enumerator, but in this case we don’t do anything with the message, just pass it along to the client. The last step is the code of the FaceDetect.detect function. The java version, see earlier mentioned article, is very easily converted to a scala one. The only issue I ran into was with the BytePointer constructor. One of the signatures accepts a varargs of the type byte. In java this allows me to just supply this constructor with a byte, in Scala however this doesn’t work. Luckily though, a BytePointer can also be created using a ByteBuffer. For the rest this is a one-to-one conversion of Java to Scala. And that’s almost it. By default play listens on port 9000, in the Jetty based example we had the server running on 9999 and listening to the root context. To work with our Play2/Scala based server we just need to point the browser to the correct websocket server url.